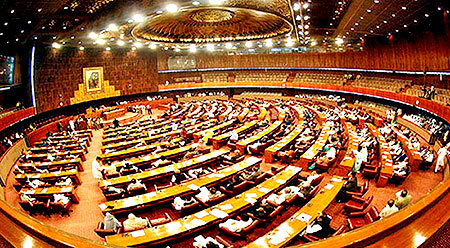 May 20; while it is heartening to note that despite being bitterly divided over Panama Leaks, the National Assembly was able to pass the 22nd Constitutional Amendment Bill, 2016 unanimously on May 19, the hasty passage yet again contributes to the negative trend of rushing legislation through the Parliament. The 22nd Amendment to the Constitution has brought about much-needed and long-demanded reform in the qualification of the Chief and Members of the Election Commission of Pakistan. This change, however, only fulfills one requirement of the many crucial, but still pending, electoral reforms. The piecemeal approach to electoral reforms reflects the absence of required focus on the issue by the Parliament. The Parliamentary Committee on Electoral Reforms, formed on July 24, 2014, had set a term of completion of its work in 4 months. Regrettably, however, after almost 1 year and 6 months of its work, it has, so far, failed to table a comprehensive package of electoral reforms in the Parliament. More often than not, it is witnessed that instead of bringing important legislation in time, the Government and Parliament move in at the eleventh hour to do the needful. Apparently the passage of the Amendment was prompted by the approaching completion of the term of the 4 ECP members set to retire in June 2016. According to media reports, the Federal Ministry on Parliamentary Affairs wrote to the Speaker, National Assembly on April 26, 2016 to constitute the Committee. The Amendment, as a prerequisite, already appears to be delayed and the Committee hasn’t been formed to-date. 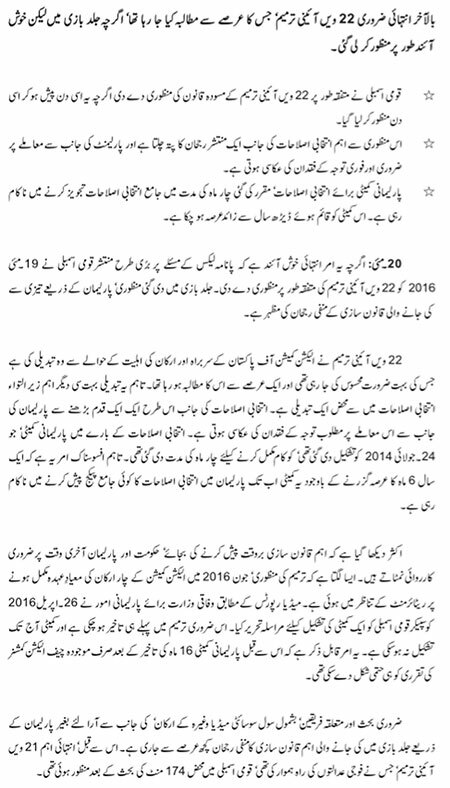 It is also worth noting that earlier, the Parliamentary Committee was only able to finalise the appointment of the existing Chief Election Commissioner after a delay of 16 months. The negative trend of rushing important legislation through the Parliament, without the requisite debate in the legislature, and any input from concerned stakeholders, including members of the civil society, media, etc. has been going on for a while. Earlier, the all-important 21st Constitutional Amendment, which paved the way for formation of Military Courts, was passed after only 174-minutes of debate in the National Assembly.